Busy by Tony Crabbe is absolutely one of the most influential books that had a really big impact on my life and business, but also many others. The absolutely unique approach towards the business success and happiness in life that Tony introduced is just amazing and makes 100% sense. This is not just another book repeating and copycatting the words on self-motivation and success subject. Busy is not the book made up by someone who read 5 similar books and decided to write the own, which is many times the case. The psychology behind the book is based on the study of life and business of Tony Crabbe himself. The improvement and understanding of what is laid down in the book is absolutely crucial for the healthy and successful business and life. 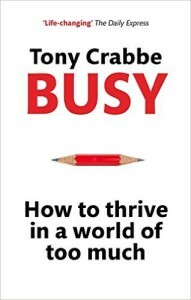 In a nutshell, the main subject that Tony brings up is, what does that mean being busy, either in life or a business. The majority of people tend to drive themselves crazy and into the mental breakdown, simply by not understanding that it’s not about have everything done! In the other words, rather work smart than hard. Or to do more, doesn’t necessarily mean to gain more. Because of Tony Crabbe’s background in the business and psychology, and immerse passion for the subject, he is truly qualified to be talked about as an expert. It’s his kind of a life story and an explanation of what being busy actually means, and what we think it means, clearly shows that from some reason, we have certain things coded from our young age, taught by adults, that being busy is the way to be. Also, it kind of seems like a huge benefit to the world rulers, the men in the power, that if you keep the people busy and occupied with a lot of stuff that they think they have to do, nobody complaints about anything. It’s difficult to ask anybody ‘how are you?’ without hearing the word ‘busy’ somewhere in their response. We feel overwhelmed by busyness because of the demands on our time: our inbox and our to-do list are bulging, a huge amount of people expect things from us and our organisations are trying to do more with fewer people. But it doesn’t have to be that way. In reality, busyness isn’t essential. Yes, there is a lot to do, but believing you’re always busy because you have so much to do is both false and unhelpful. Busyness is a normal response to a world of too much, but it isn’t the only response. In busy Tony Crabbe draws on solid psychological research to address one of the great problems of modern life: we’re too busy. But it isn’t a time-management book. Rather than providing advice for increasing productivity and efficiency, it sets out four key strategies (corresponding to sections of the book) for thriving despite of the overload of too much:1. Mastery – to move beyond busyness you need to regain a sense of mastery over your life. This section shows you how to build a sense of control back into your life, take responsibility for making choices and how to set boundaries to protect you from the flood of demands and information. 2. Focus – in a world of too much, success is not about doing more at work but about making an impact. This section outlines three ways to move to a career strategy that doesn’t rely on productivity alone. 3. Engagement – busyness can cause you to disengage from the people, values and activities that are important to us. This section provides you with the three keys to re-engaging with your work and life. 4. Momentum – part of the challenge to moving beyond busyness is that even if you agree you should make the change, you’re too busy to find the time and energy to do anything about it.